Yesterday was Father's Day and I spent about 4 hours crocheting this moose. I was to be at my parent's house by 5:30pm and I believe I put in the final stitch at 5:15pm. Talk about flying by the seat of my pants! I had a body and head already made for a project I had abandoned, thank God for that! And I also had the overalls already made. I stripped them off a bunny. Poor naked bunny now sits with no pants, lol. hook size you plan on making your moose with. Here's Art in the car on the way to meet my Dad. My youngest son made sure to put a seat belt on him, safety first! And here they are meeting for the first time. My Dad laughed and laughed when he pulled Art out of that gift bag. I couldn't have asked for a better response! I'll call it a night now, it's almost 2am and I'm about to fall asleep right here at my desk. 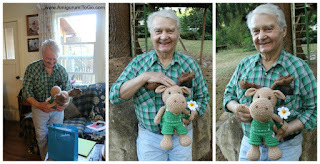 I hope you enjoyed meeting Art and come back soon to get his pattern! Lovely! Can't wait for the pattern. It's been definitely worth all stress! And to see your father that happy and surprised is the best satisfaction you can get ;) Just love it! And I don't know why, I wonder if it was a glitch in the system. 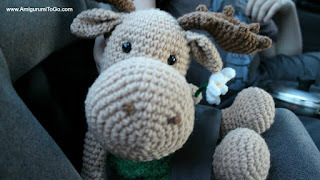 For a little while my blog was not appearing in Ravelry and also when I'd post a link from here no thumbnail pictures would show but now everything is working fine again. I don't know how to find out if the email system is working as I don't control it at all, it's a google thing.. which is a bit of a bummer, but I'll research and find out if there's anything I can do. Thanks for letting me know! I looked in blogger help forums and it seems to be an issue for many but there's not any answers how to fix. Blogger did an update a couple months ago and that's when people started noticing the email problem. I guess we'll have to wait for blogger to figure it out. Huge bummer for sure! 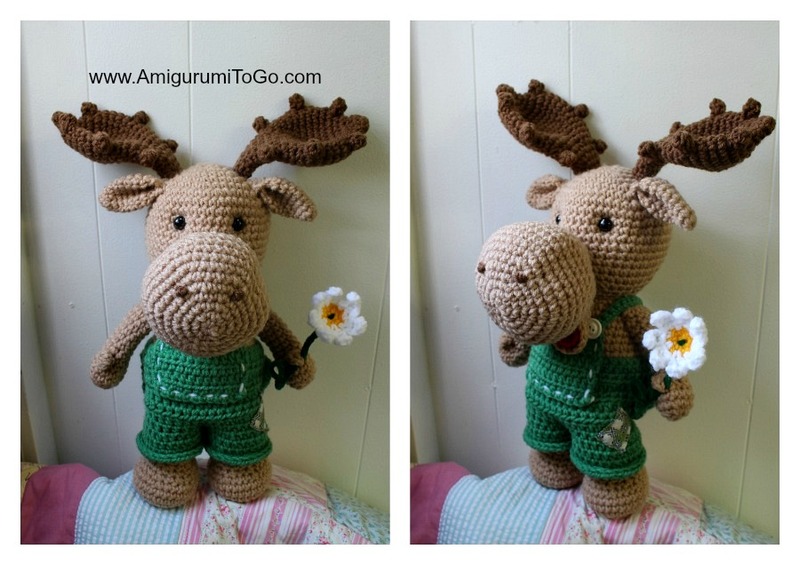 I just love your moose and as always beautiful and great work Sharon looking forward to making him. Glad your dad was happy and if I could have the chance again to give a present to my dad it would be from your patterns like the monkey. Thanks for sharing your great talent with others.